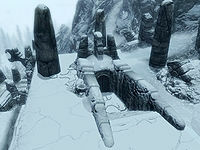 Lost Valkygg is a Nordic ruin, the entrance of which is in the exterior of Labyrinthian. Lost Valkygg is northeast from Labyrinthian. 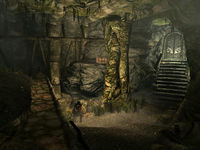 To find the entrance, go up two sets of stairs to the east of the circular building where you find the Wooden Mask in Labyrinthian (i.e., from where Labyrinthian is marked on the map). Then face north and go down a set of stairs to find the entrance to Lost Valkygg. Do not go in the door to Lost Valkygg that is at the top of one set of stairs to the east of the circle; that door will only provide access to the last chamber of this dungeon. Instead, go up the stairs to the left (north) of those stairs, then up the set of stairs that will be to your right. Upon entering you are in a corridor. Follow it around and down two flights of stairs. 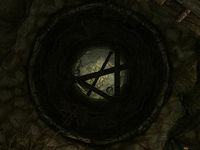 You will be facing a window to a room containing two leveled draugr lying on a stone slab. There is a salt pile on the window ledge. If you want, you can attack the draugr through the window before following the path to the west. There are three pressure plates along the western corridor, at the end of which there is a doorway. If the entrance is blocked by vertical bars, then you will need to walk across the pressure plates in order to temporarily lower the bars to allow access. If they are already retracted (see bugs), the pressure plates can be avoided entirely. Once past the bars you are in a small area with a sideboard in front of you, on which rests a thistle branch, salt pile and potion of minor healing, with a burial urn and sample of snowberries on the ground in front. The corridor continues to the south, before turning east and entering the room you could see through the window. Avoid the bone chimes across the entrance, as they might awaken the resting draugr. In the room there is the stone table that the two draugr were laid out on along with a bowl of bone meal and a random helmet. To the east of the table are three empty bookcases and to the south a doorway leading down a short flight of stairs before turning to the west. There is an alcove with an urn, a burial urn and barrel on your left. The corridor continues down to a cave-in ahead and an open door on your left into a large room. As you enter the room, on your left is an upright sarcophagus, which will burst open revealing a leveled draugr. Around the corner to the right are two more leveled draugr. They are standing in front of a closed door to the west. There is also an open door to the south. In the room are two burial urns, an urn and an alchemy lab. The door to the south leads to a room with a set of shelves holding a pair of random boots and a burial urn. Opposite this is a lever that operates a gate in the southwest corner that leads to a small cell with a bed roll, a potato on a wooden plate, a skeleton shackled to the wall, an apothecary's satchel and a copy of the Pickpocket skill book Aevar Stone-Singer. The door to the west in the large room opens into another corridor, which splits to the north and south. To the south it ends at an apprentice-locked gate with a pressure plate in front of it and a dead draugr lying to the left. The pressure plate activates a poison dart trap, which fires darts from multiple directions. Behind the gate is a sideboard with a random helmet, two burial urns and a salt pile. Heading north the corridor descends a flight of stairs, before opening out onto a raised section of another large room. As you descend a sarcophagus to the right will open and a leveled draugr will start searching for you even if sneaking and muffled. There is an empty table and two burial urns in this room, as well as stairs leading down to the lower, western part of the room. There is a leveled draugr patrolling the lower area and the area through a door to the northwest. There are three nightshade plants, two blue mountain flowers and one blisterwort fungus around the lower area. On a raised platform is an unlocked chest and burial urn beside a large round shaft. Through the door to the northwest is a slanted room, which contains an unlocked boss chest. The local map shows the exit as if it is in this room, but it's actually from the room below. The only way onward is to drop down the shaft by the raised platform. There are wooden beams across that you can use to break your fall and avoid damage, however it's best to save before dropping. At the bottom you will be faced by a leveled draugr deathlord in a cave-like room that has obviously suffered great damage, with broken slabs of stone, a dropped walkway and general ruin. There are a couple of broken urns, that may contain minor healing potions, or you may find they've fallen out and are on the ground. There are three blisterwort fungi around the room and to the northwest on top of a rock you will see an unlocked chest. This is easily reachable by following the broken walkway and jump up from the end. To the right of this chest is a flight of stairs leading up to an iron door that is the exit. The bars of the pressure plate mechanism at the beginning will already be lowered the first time you visit, allowing you to bypass the puzzle, and reversed every time you revisit the dungeon. 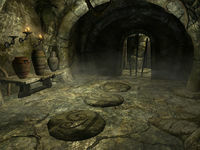 This location will be marked as cleared if Labyrinthian is cleared, even though they are two distinct dungeons that are not connected to each other. This also leads to the dungeon having a much higher minimum level than intended.